There are some amazing plants out there that are interesting all year round. I don't think there is anything that actually flowers all year but there are some wonderful evergreen foliages, colurful bark and flushes of berries. 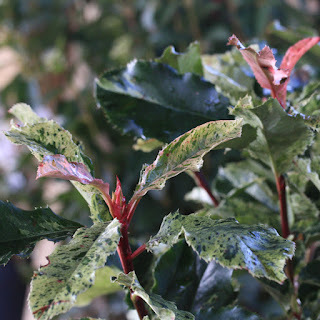 Here is a quick flash of some of the largely evergreen plants we recomend, it's a useful list. These are shrubs to concider planting for all year round interest. Most of these plant are available at the Nurseries alternatively we mail order online from our website or you can call the Nurseries, or why not visit us at Preston Bissett very near Buckingham and close to Bicester, Milton Keynes, Oxford and Aylesbury. 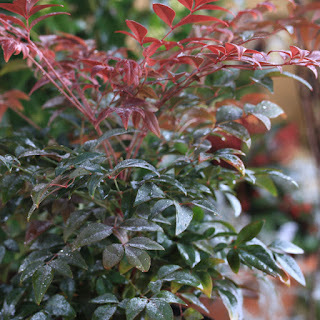 Pictured above is the glorious evergreen Nandina Domistica 'Obsessed' , soft red foliage and blossom followed by autumn foliage and berries. New varieties are emerging and we now have a yellow'Brightlights' and a gorgeous varigated red 'Twlight' which we have managed to get hold of this January. 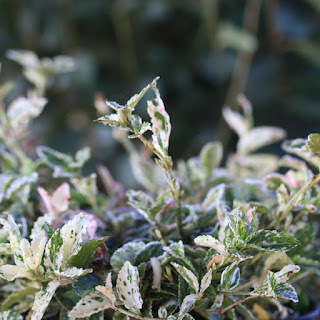 On this shortlist of shrubs with all year round interest we have clearly had to restrict ourselves and often pick one variety hopefully the most deserving from a whole family of interest. 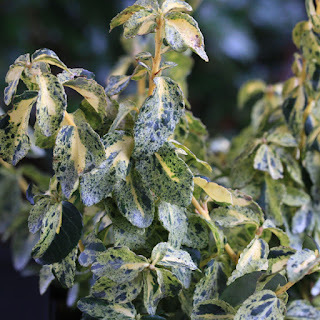 Varigated foliage can bring a bit of light to the dark winter days. The foliage of Rhododendron Poniticum Variegatum is a lovely ray of light and the violet,mauve showey blooms in summer are a fantastic but extra bonus.This is a great rhododendron to fill a container and stand alone. 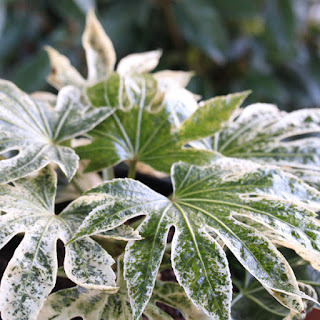 Fatsia Spiders Web (caster oil plant) is a relatively new addition. Another bright silvery foliage. It has the added bonus of retaining it silvery tones in shade and not reverting to a darker green. 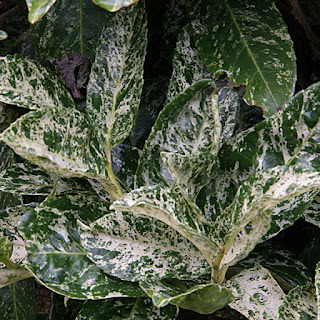 A virus has been added to the leaf and like aucuba it retains its colour. Its really unusual. One plant that is surounded with a little contraversy is the Photina Pink Crispy. The RHS judges at chelsea sugested it should not have been invented when it was launched in 2013. I think they are wrong and the fact it sells has proved that. Its very different. Yes it is very striking but in the right place it can bring a lovely hightlight to a border. The colour is quite amazing, though I think you will love it or hate it! It keeps its colour in shade. 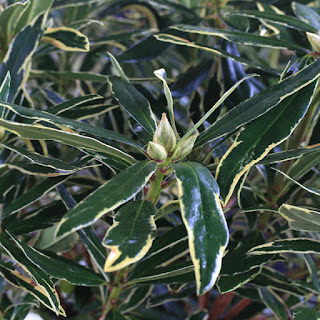 Euonymus Harlequin has made its marked and it becoming a regular core plant for a lot of gardens. Small soft siver leaves to be planted at the front of the border. A lot of siver euonymus come and then are superseeded. I think this one stays. Alas we know have yellow harlequin this is available now on the Nurseries and I hope it is as sucessful as its counterpart. Here is a quick preview as we have some in stock.